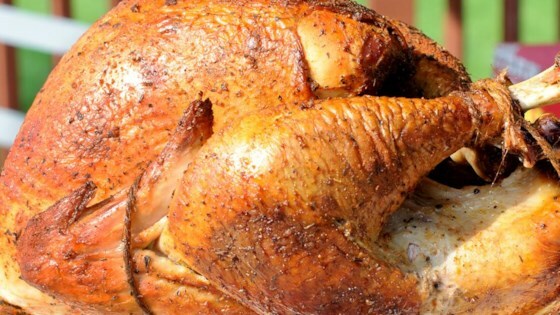 "Smoked turkey is a delightful way to cook a turkey while relaxing. I know lots of people are a bit apprehensive about preparing their first smoked turkey. I have smoked over 100 and never has a bad one. The skin is beautifully tanned and the meat is so juicy." Rinse the turkey and pat dry with paper towels. Combine savory, sage, salt, and black pepper in a bowl; rub half the herb mix inside the turkey's cavity and inside the neck cavity. Loosen turkey skin over breast and legs; rub remaining half of the herb mixture underneath the loosened skin. Rub olive oil over the entire turkey. Light 20 charcoal briquettes and place half of them on each side on the lower grate of a kettle charcoal grill. Place a drip pan or disposable aluminum baking pan in the middle of the lower grate and pour in water. When the coals are gray with ash, place a 2-inch square piece of hickory or other hardwood onto each bank of coals. Place turkey on the cooking grate and cover the grill. Monitor the heat with a grill thermometer to maintain temperature between 150 and 250 degrees F (65 to 120 degrees C); add 3 to 5 coals to each side about every 1 1/2 hours. If pieces of hardwood burn away, add more to keep a steady stream of smoke rising from the wood. If open flames erupt when you open the lid, douse them with a drizzle of water or beer. Smoke the turkey for 20 minutes per pound, about 4 hours; let the heat increase to 250 degrees F (120 degrees C) during the last hour of smoking. An instant-read meat thermometer inserted into the thickest part of a thigh, not touching a bone, should reach 165 degrees F (75 degrees C). You can also brine the turkey with 1 cup salt per gallon of water for 12 hours in the fridge (this helps thaw it faster too). I marinated the bird overnight in brine in the fridge. Absolutely, will make it again. It took about 6 h to cook on the smoker. Used a propane smoker but followed the recipe otherwise. Turned out great! Delicious! We used this recipe for our family Thanksgiving. We smoked it at 200 for about 4 hours.